When it comes to top cuddle buddies, teddy bears and cute dogs are pretty much neck-and-neck for first place. Enter Tonkey, the Insta-famous pup who seems to be part plush toy and part canine. She has recently soared to Instagram fame with her Instagram account, @bearcoat_tonkey. Really, she’s 100% Shar Pei, but followers are convinced she’s got some sort of bear DNA in there. What she really has is a plush coat, which is rare for the breed – both of a dog’s parents must possess a recessive gene for the pups to inherit Tonkey’s signature fuzz. She’s just four months old, but has already amassed quite the following on Instagram with nearly 119, 000 followers. Keep in mind, this account has only been active for eight weeks. It’s easy to see why Park is nervous about her dog’s growing popularity. Tonkey has the adorable pet thing down pat. Whether she’s walking down the stairs – (or at least, attempting to). Tonkey’s clearly got the making of super-dog-dom. This fluff ball may be captivating the internet, but at home, she shares the spotlight with sister Maxi. Four months old, and already an internet sensation. Don’t be surprised if you see Tonkey taking the path of the pioneer Instafamous pup, Boo. We’re talking stuffed animals, books, phone cases – c’mon, you’d buy it too. 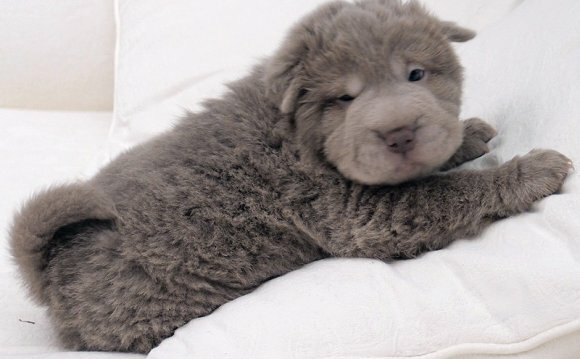 Shar Pei Welpe mit bear coat sehr selten!